Being Retro: Rebel, Rebel Yell! 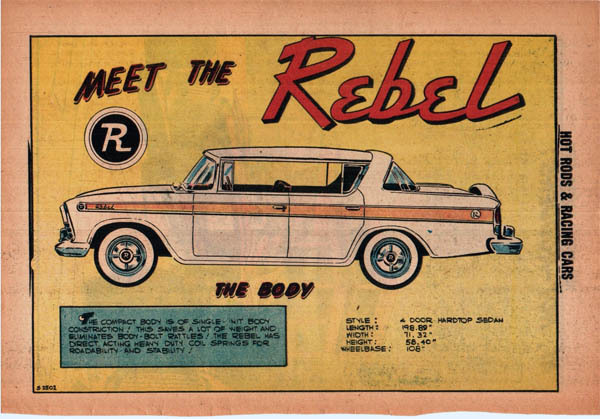 The first muscle car - I didn't know that! Oh, wow. I had an old used Rebel when I was in college. It was so powerful, it was impossible not to speed in it. I loved it but it was terrible in the snow and really hard to get started in the winter. I loved that car. Funny that picture of David Bowie. You wouldn't see someone with a cigarette dangling from his mouth today. Once saw him at the airport when we were travelling to the UK. Not a car I remember. Wasn't in England.